Hello, My name is Amanda. I am an Artisan Chocolatier who lives, works and plays in Pemberton and Whistler, and I’ m the proud owner of The Chocolate General Store. I am born in Belgium, and that is where my story begins. Growing up, fine chocolates were always part of our family’s celebrations, be it a birthday or Christmas – there was always a box of fine chocolates on the table! Fast forward a number of years and I find myself in Canada with my own family. Inspired by the local entrepreneurial spirit, and the wish to make people smile, I decided to start making chocolates. I knew I wanted it to be genuine and made with only natural ingredients. 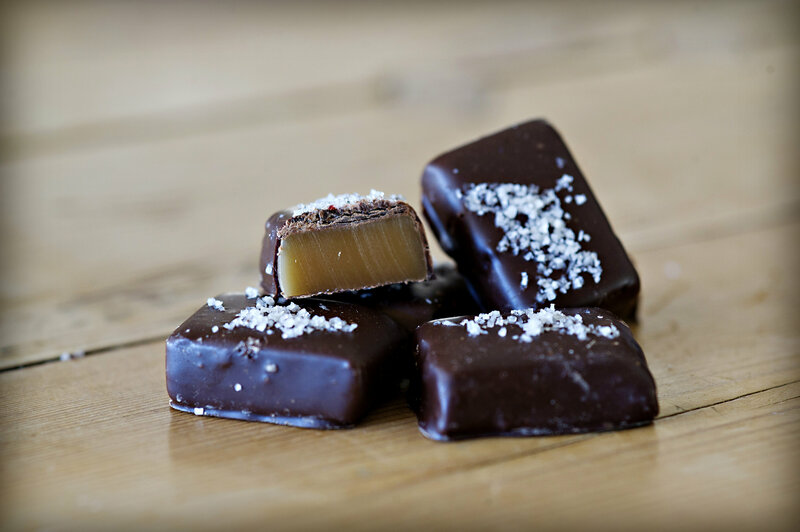 I wanted my chocolates to be wrapped the way you would have bought them years ago at the General Store – back when that was the place families went to buy treats hand-wrapped in paper cones. That is how I came up with the name of my company and the packaging for my first product line – Chocohappy. Each flavour is put in a hand rolled paper cone with its own fun colour. The confections are handcrafted, using only the finest ingredients like Belgian Chocolate, freshly roasted nuts, fresh cream, butter, sugar and honey. My hope is to delight you and make you happy – Chocohappy!